Supporting and moving loads weighing several thousand tons and measuring up to 300 meters in length - for shipyards, the safe handling of extremely heavy loads is part of day-to-day operations. This is done under extreme time pressure. Therefore, the technology must be always available and highly reliable. Bosch Rexroth offers hydraulic and electric actuators for heavy loads and complete system solutions. Manufacturers and users benefit from our experience: worldwide, Bosch Rexroth has already automated numerous ship lifts, dry docks and other shipyard facilities. Industry specialists accompany projects from the initial idea to commissioning and lifelong service. Whenever service is needed, Bosch Rexroth and its local specialists can react quickly and with the required expertise. The given task determines which technologies will be used. For instance, shipyards that build, maintain and repair mega yachts must fulfill special requirements, as these ships must be handled with extreme care so that their flawless appearance does not get marred by scratches. 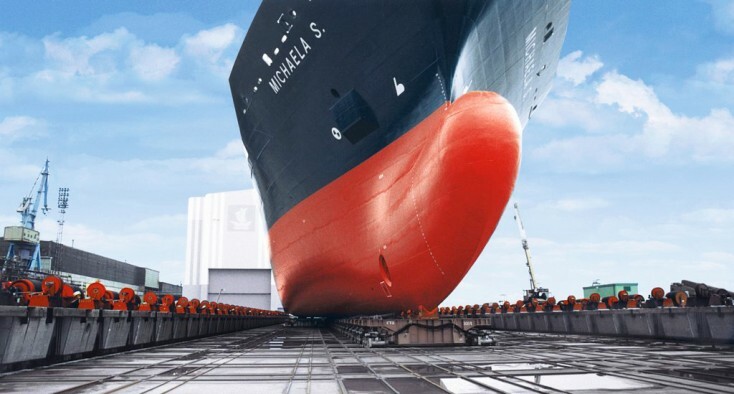 Bosch Rexroth offers shipyards modular and pre-configured mega yacht ship lifts specifically designed for a fast and gentle lifting of these vessels. For machine and equipment engineers, industry knowledge is an important factor in selecting their partners. Bosch Rexroth offers you application experience in shipyard automation around the globe along with local contact persons for any project. From defining the project objectives to commissioning, the project will be supported by experienced specialists throughout its entire course. Using proprietary simulation programs, they will verify that all components function properly and are designed in line with the task at hand.